The International Chinese Musculoskeletal Research Society (ICMRS) has co-sponsored two journals, The Bone Research and Journal of Orthopaedic Translation. In April 2014 Nature Publishing Group (NPG) and the West China School of Stomatology, Sichuan University, begin their partnership by co-publishing Bone Research. Bone Research is an open access, peer-reviewed publication. The aim of the Journal is to foster worldwide dissemination of the best and most interesting research in bone-related physiology pathology, disease and treatment. NPG’s excellence in publishing will ensure that all research published will receive high exposure through online hosting on nature.com, extensive press coverage and rapid publication. The editorial team is led by the internationally renowned Professor Xue-dong Zhou as Editor-in-Chief, Professors John P. Bilezikian, Thomas L. Clemens and Qian-min Chen as Executive Advisory Editors. A highly respected editorial board of researchers from across the globe will be working with the editorial team of Bone Research and with NPG to further define and shape the bone-related fields. 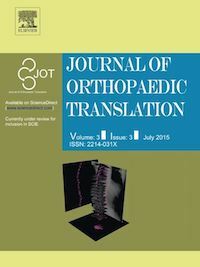 The Journal of Orthopaedic Translation (JOT) aims to focus on the rapidly growing field of orthopaedic translational research. While there are a number of high quality orthopaedic journals, none are solely dedicated to the field of orthopaedic translational research. The importance of translational research is quickly being recognized by all spectrums of the scientific community, from clinicians to basic science researchers. To truly improve the health of people, scientific research on the cellular and molecular level must be utilized and applied appropriately in the clinical setting. A journal that is purely dedicated to the art of translational research will be a monumental step in the advancement of musculoskeletal care by bringing cutting edge knowledge to the forefront and allowing pioneers of orthopaedic translation to exchange and mutually enhance expertise. The JOT aims to be that linking factor and is looking forward to receiving high quality manuscripts that will advance the field of orthopaedic translation. Journal of Orthopaedic Translation is published by Elsevier for the Chinese Speaking Orthopaedic Society and the International Chinese Musculoskeletal Research Society.